Heaven 17 was a synthpop group with a funky dance sound from the eighties in the UK. The band was made of 3 members. Glenn Gregory on Vocals, Ian Craig Marsh on Synthesisers, Saxophone, Percussion and Martyn Ware also on Synthesisers, Piano, Percussion and Backing Vocals. Penthouse and Pavement seems to of taken a massive revivial in recent years since its 1981 release, with fans celebrating it almost 30 years on. The album was recently played live in its entirety by the band for the first time ever. They were renowned for never touring. The concert in Sheffield was filmed and shown on BBC Two on 16 May 2010. A documentary about the making of the album was screened the following night. 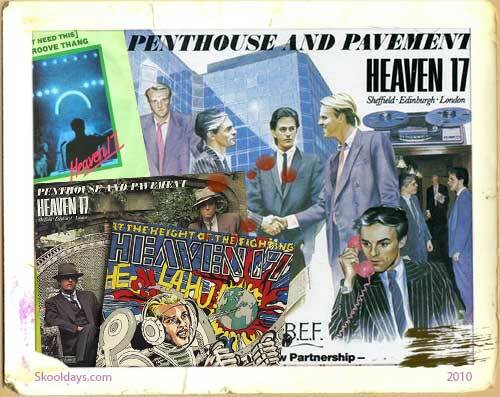 Penthouse and Pavement is the debut album by the English group Heaven 17, released in the early eighties. This incredible concept album idea had been around for a while, but these Sheffield lads after having various success in other pop groups including The Human League, put together an album worthy of admiration. The Album showed both sides of society, the Penthouse and the Pavement, reflected in the A side and the B side of the Album. The first single aimed at criticising Britain under Prime Minister Margaret Thatcher and the rise of the Yuppie. Named (We Don’t Need This) Fascist Groove Thang, it demonstrated the left-wing outlook of the group. Other themes explored include nuclear war, religious extremism and American influence in the world. Heaven 17 used funk mixed with pop to create a meaningful and yet danceable album. Whilst the singles charted poorly, the album charted at No. 14 and remained in the Top 75 for 76 weeks. It was certified Gold (100,000 copies) by the BPI in October 1982. Other memorable parts of the album was the fact that everyones album finished differently due to the fact the last track on the original LP release, We’re Going to Live for a Very Long Time, was recorded up to and onto the runoff groove; meaning the run time of this track (as labeled on the LP sleeve) and the album is infinite, looping the line “For a very long time”. The other memorable point of the album was the hand drawn cover showing the Sheffiels lads as yuppies living the Penthouse life. With business meetings and deals being made along with the superb eighties suits and pony tales, this was a peace of historical art that looks great 30 years on. This entry was posted in Fashion, Pop Culture, PopMusic by Skooldays. Bookmark the permalink.